Please note: When ordering a gate, the actual width of the gate will be a few inches narrower. 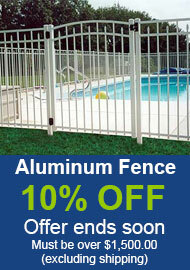 For example, a 48 inch wide gate will fit a 48" wide opening (inside to inside post dimensions). The gate will be a few inches narrower than 48" to accommodate the latch and hinges. Please call if you need a customized size of gate. For arched gates click here.